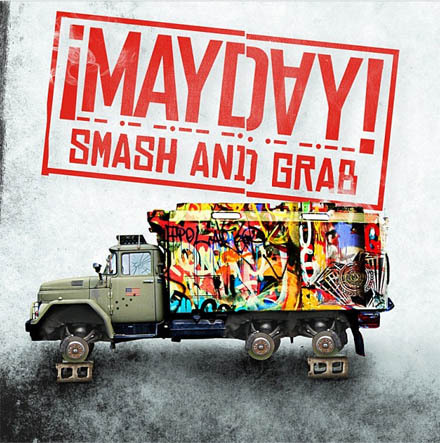 Oh, you thought you’d make it out of 2012 without more freshness from ¡MAYDAY!? After breaking out in 2012 with their Strange Music debut, Take Me To Your Leader, and follow-up EP, Thrift Store Halos, the Miami crew has officially announced plans to drop the Smash And Grab Mixtape on December 20th. ¡MAYDAY! hit the web recently to reveal the official artwork and release date for the new project, which will mark the band’s third release in one year. With ¡MAYDAY! already known to record large amounts of music during sessions, there’s no telling just what will end up on Smash And Grab. Are you excited for new ¡MAYDAY! music? What do you think the mixtape will have on it? Freestyles? Remixes?